Vector screenshot using AI -> Add some filters on PS and done. Not very complicated, yet it was time consuming. I am not a pro at making wallpapers. For the vectoring I didn't make any lines, mainly because I was lazy but also because I thought that it wasn't necessary. I also did the colouring in AI. 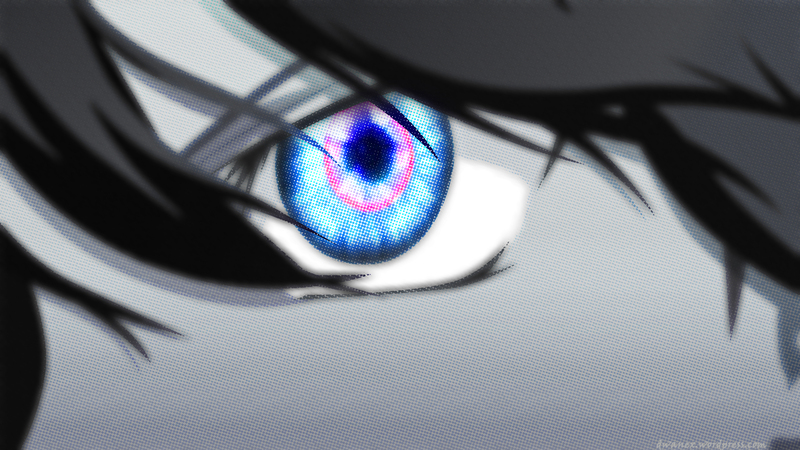 Halfway through the vectoring I discovered that the eye would be impossible for me to draw (I tried a couple of times myself), therefore I decided to use the original from the screenshot and then add som filters. Then I exported it to PS, to add filters and effects. I created a couple of layers each with different stuff, e.g. one had the original screentshot and a couple of layers were modified versions of the vectored screenshot. To create the "dot" effect I created a new file to halftone to get the dots, then I pasted it into my main .psd and select deleted. I also blurred thing with box blur and increased the contrast of the eye. Thanks again for reading. Have a good time. Use it if you want to, don't use it if you don't want to.